Private Mail Bag No. 1022 Lagos. Life is unpredictable and anything can happen. But it’s advised that one should not misplace his/her certificate. It should be well safeguarded because it’s usually boldly written at the edge of the certificate that no substitute will be issued if the certificate is lost. The West African Examination Council does not issue a duplicate certificate. But if due to unforeseen circumstances you lose your WAEC certificate, the only available remedy is to get an Attestation of Result from WAEC. Instead of having nothing to prove it. The Council, however, now issues Attestation of Results which are as valid as the certificate. Users who wish could confirm the details on the document with the Council. Latest requirement updates by WAEC was on 1st March, 2016. Management has approved the issuance of Attestation of Results as a replacement for lost or damaged certificates. 1] Police report on lost or damaged certificate. 2] Sworn affidavit for collection of Attestation of Result. 3] Birth certificate or relevant document showing date of Birth. 4] Photocopy of lost or damaged certificate/result [where available]. 5] Two (2) recent passport photograph of the candidate. 6] Administrative fee of Twenty thousand naira (N20,000.00) only in cash or draft payable to WAEC. Application for attestation of result can be received in any WAEC offices nationwide and forwarded to the DR [SED] or DR [PCED] Yaba, as appropriate for processing. 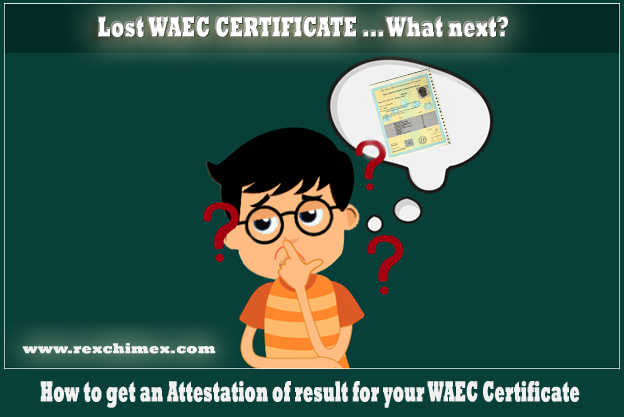 Note - Attestation of WAEC result can only be obtained in the state, where you wrote your WAEC e.g., If you wrote your WAEC in Lagos, goto WAEC office in Lagos to apply for WAEC attestation. If you go to another state for WAEC attestation, you will be redirected back to the WAEC office located in the state where you took the exam. Hello my fellow student i am Opatola Julius,i would like to use this medium to thank Miss,Grace who helped me upgrade my waec g.c.e result, i had written the exam many times but could not make my chemistry until i got Miss,Grace number 09052695605 from a friend i called her and told her my problem ,i was shocked when the next 2 hours she sent me a pin ,in which i used in checking my result,and as God would have it i made my chemistry A1, friends i was also told that she help in the upgrade of all kind of result ,she even helped my friend to release and upgrade her held result with a Good grade if you want to gain admissions into any university of your choice You can call her now 09052695605,.,.